When you purchase an annual supply of contact lenses, you’ll receive a $25 discount on any pair of ready-to-wear sunglasses. Protect your eyes from harmful UV rays. Wearing quality sunglasses is just as important as sunscreen. Cheap sunglasses may actually be more harmful to your eyes than not wearing any at all. Sunglass purchase must be made within 30 days of initial purchase. Discount valid for purchase of one pair of sunglasses. 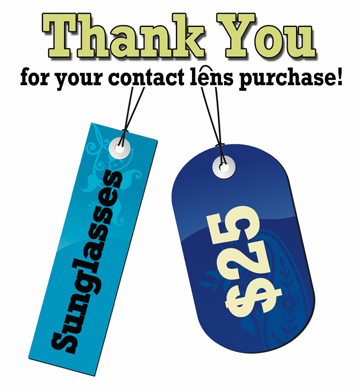 Sunglass discount is intended for the patient purchasing the annual supply of contacts. Most insurance plans do not cover ready-to-wear sunglasses. An annual supply for monthly replacement lenses is considered to be four 6-packs. An annual supply for 2-week replacement lenses is considered to be eight 6-packs, four 12-packs or two 24 packs. An annual supply for daily replacement lenses is considered to be eight 90-packs or twenty-four 30-packs.